Botrychium virginianum. By Ben Kimball. Copyright © 2017 Ben Kimball. New England Wild Flower Society. gobotany.newenglandwild.org (Accessed 11/2017). 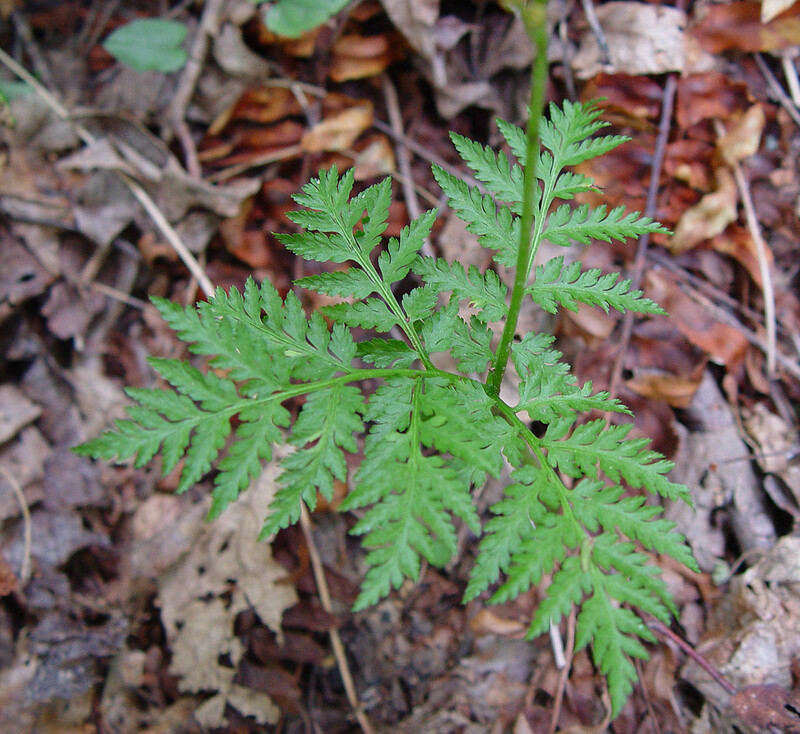 Botrychium virginianum is a fern, 20-75 cm tall, from fleshy, mycorrhizal roots. Botrychium virginianum. leaf. By Arthur Haines. Copyright © 2017. New England Wild Flower society. gobotany.newenglandwild.org (Accessed 11/2017). Leaf solitary, 7-20 cm long, 10-30 cm wide, triangular, sometimes appearing 3-parted, 2-4 times pinnate, each segment toothed, thin, deciduous; spore-bearing stalk 7-20 cm long, spore bearing leaf 6-15 cm long, with opposite branches, 2-3 times pinnate, held above sterile frond from top of leaf stalk. Botrychium virginianum. sporophyll. By Arthur Haines. Copyright © 2017. New England Wild Flower Society. 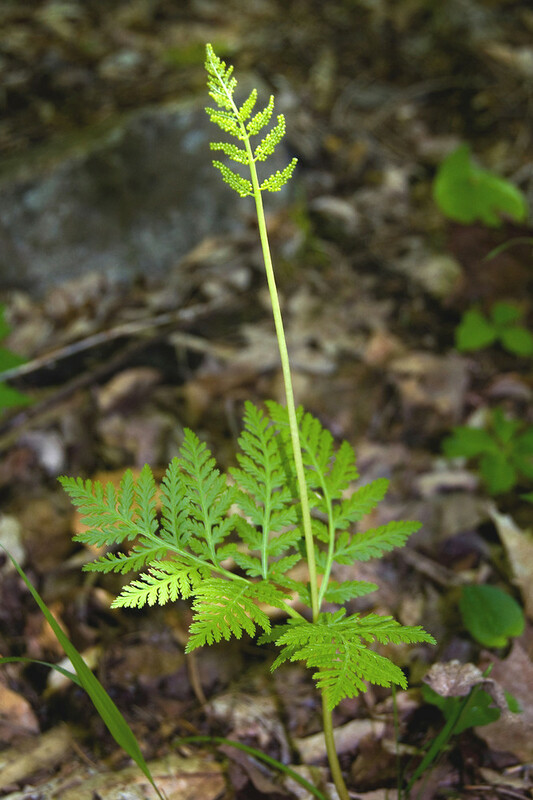 gobotany.newenglandwild.org (Accessed 11/2017). 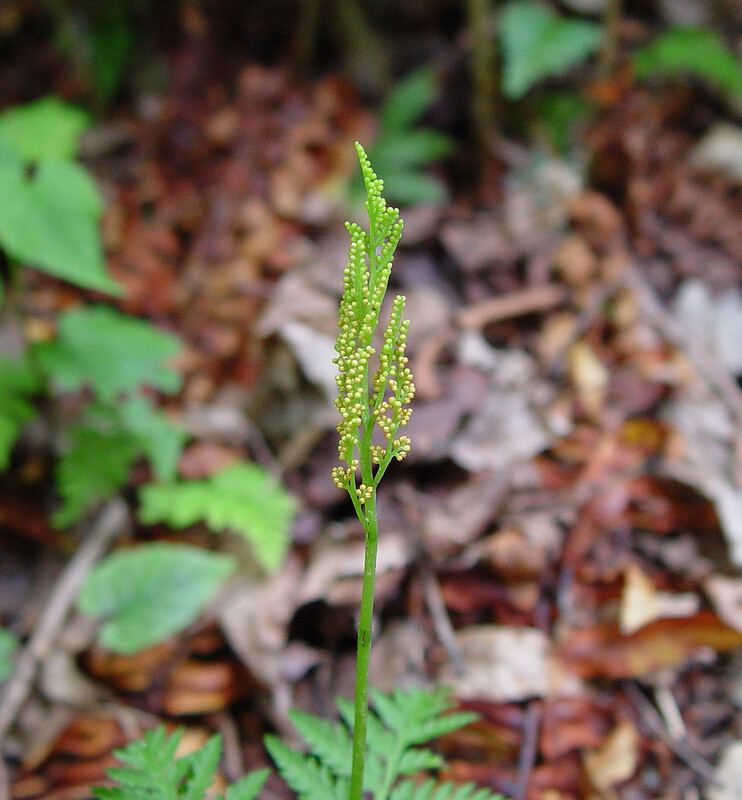 Spore cases round, numerous on a specialized leaf (sporophyll) taller than the leaf (frond), develop in spring. Frequency in NYC: Very infrequent but more frequent than B. dissectum. Habitat: Herb layer of moist, undisturbed forest. Notes: Gametophyte non-photosynthetic, closely associated with specific fungi below ground similar to Lycopodium sp. (S. Clemants, personal communication). This species may tolerate transplantation, if in need of rescue (Montgomery and Fairbrothers 1992). Leaves eaten by Ruffed grouse, rabbits and deer (Martin et al. 1951).